RVing Mississippi has some pretty unique places to visit. However, there is one particular spot that really needs to be acknowledged by just about all RV'ers. Before we go there, I must ask how many of us would really want to live in a town called "Chunky" Mississippi?! It is located just south of I-20, about 30 miles west of Meridian. Just imagine trying to make a hotel reservation by phone and your last name happens to be Skinny. "Yes, my name is Bob Skinny - from Chunky, MS. I don't know about you, but I'd probably hang up if I were the clerk!? 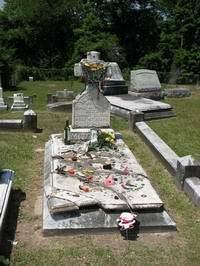 You guessed it - The King and Queen of Gypsies are buried here in the Rose Hill Cemetery, in Meridian, Mississippi. Now, some of you will be asking, just what does that have to do with "me"? 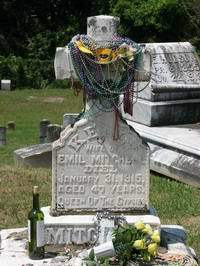 Well, if you are a Fulltimer, RVing Mississippi, you owe it to yourself to stop and pay "homage" to the King and Queen of Gypsies, of the United States - Emil and Kelly Mitchell. 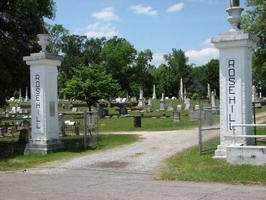 According to "Roadside America", Emil and Kelly Mitchell have been buried here in Rose Hill Cemetery since 1915. Their "Royal Family" are all buried here for some very interesting viewing - and personal reflections! Coming to their grave site had a certain "connection" as an RV'er. Many people call us "Gypsies" and I can certainly understand that. We travel all across the country, either work or relax in an area and then move on to another location. We usually don't have a "real job", as per society and we travel with all our belongs!! I've also heard that we are considered "homeless" - we don't have a job and we don't have a house! Well, I'll take this wonderful lifestyle anytime!! What better way is there to travel the United States and see all the wonderful sites it has? RVing Mississippi was just one of the many wonderful states we get to see in our RV.